During the Wikimania meeting the documentary about Aaron Swartz, The Internet’s Own Boy, was shown. In that documentary we learned that Aaron Swartz was 12 years old when he created the Wikipedia-like site InfoBase. Thus prodigies can create wiki web sites when they are 12 years old. From that we can deduce that it is unlikely that a six year old female can produce a wiki web site. The closest explanation for my extraordinary vivid experience at Wikimania I can come up with is then that it was a hallucination. My question is then: How do I get rid of the hallucination? Have other Wikimania participants had a similar hallucinations of meeting preteens claiming to make web sites? Or am I just getting old? The hallucination has persisted for many days now because I still both see and feel the business card I got. This entry was posted in humor, technical and tagged wikimania, wikimedia, wikipedia. 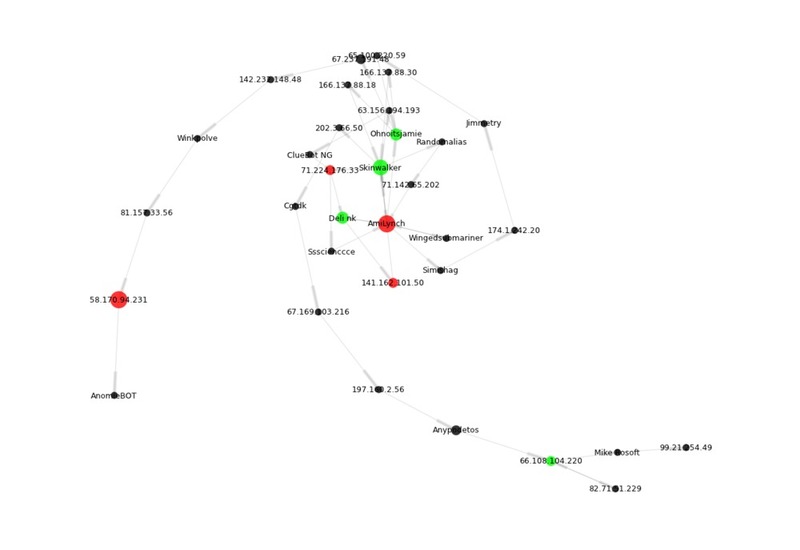 Sentiment colored sequential collaboration network of some of the Wikipedians editing the Wikipedia articles associated with the Lundbeck company. Red are negative sentiment, green are positive. The “sequential collaboration network” is inspired by Analyzing the creative editing behavior of Wikipedia editors: through dynamic social network analysis. Brian Keegan has also done similar kind of network visualization. Sentiment analysis is based on the AFINN word list. This entry was posted in programming and tagged afinn, network analysis, sentiment analysis, wikipedia.